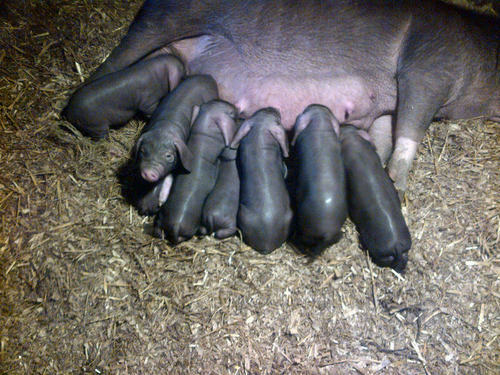 A litter of rare Meishan (Dumbo) piglets have been born in the UK, the first in over 30 years and the offspring of one of the only three Meishans in the country. Meishans when fully grown are by far one of the more unusual looking pig breeds in the world, incredibly wrinkly faces and extra long black ears giving a comical appearance not dissimilar to Dumbo. Meishans were last seen in the UK over 30 years ago, when 20 pigs were imported from China by a British genetics company for research purposes. In the US and Canada their ability to produce large litters have led to their use in crossing with both commercial and traditional breeds to increase litter size and add succulence to the meat.